President Trump may be a punching bag for the news media and late-night comics, but there's little doubt he's a pioneer when it comes to clinical documentation. According to Harold Bornstein, MD, Trump's former physician, the President dictated his entire health assessment in 2015. While others rail against Trump's pompousness for committing such an act, I salute his effort to make life easier for clinical documentation improvement (CDI) specialists. After years of lamenting how most physicians fail to capture the essence of patient encounters, the answer is clear: Patients must follow the President's lead and document their own care. Currently, initiatives such as OpenNotes allow patients to contribute to their medical record. However, those efforts pale in comparison to the genius of Trump, who has taken the concept to another level. Consider the advantages if patients submitted their own visit notes. Researchers would marvel at the depth and incisiveness present as they delve into solving health care's most pressing issues. No longer would mundane blood pressure readings be numbers only. Flowery adjectives such as "astonishingly excellent" would make 115/65 spring to life in a new context that would turn heads among both medical and literary experts. For CDI specialists, physician queries would likely become a thing of the past. Is the patient healthy? If the report, like Trump's, reads "unequivocally," then there's really no need for clarification. Concerns about copy and paste would all but evaporate while hyperbole would be welcomed. 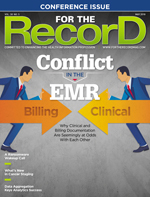 You may argue that patients writing their own reports would delay getting bills out the door. No, I say. First, can the process really get any slower? Second, having patients responsible would dramatically cut health care costs as consumers learn to skew the system in their favor so that it appears they received the least amount of care possible. Who knows, they may one day master the intricacies of how to document for the lowest possible diagnosis-related group. Under this system, Washington would no longer have to debate universal health care. Instead, it could spend more hours figuring out interoperability standards. No question, it would be—to quote the man himself—an "astonishingly excellent" system.